Veggie Food: The plastic knife and fork is a classy touch. Vegetarian Oriental: Aegean Airlines called this meal the 'Vegetarian Oriental.' Yum. It seems that vegetarian air travellers are getting the short end of the, um, carrot, when it comes to inflight meals. 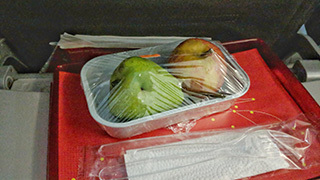 “The vegetarian meal on this flight is an apple and a pear wrapped in clingfilm, served with a knife and fork." According to the airline, the meal was some kind of mistake. Avianca asked Hogarty to contact them privately about the issue and said: "This is not our standard so we surely will investigate as soon as possible." But it’s not the first instance where airlines have struggled to deal with vegetarian meals of late. 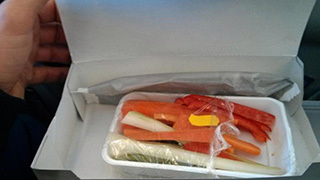 Earlier this year, a passenger who ordered the veg option on an Aegean Airlines flight was handed a container consisting of a few sticks of celery, carrot and red pepper. And it’s not just vegetarians who suffer. In May, a British pax who ordered the gluten-free option on a nine-hour flight with Japan’s All Nippon Airways was served a banana while the everyone else tucked into a full hot breakfast.